Yes, although I would have preferred to post this at a normal blogging hour, (like 10-ish which is my goal,) I figured slipping this one in during the evening would be better than waiting till tomorrow. Oh wait. Tomorrow I have another reveal. Anyway, you remember the Pinterest Challenge, yes? Well, as you can see from that old post, I decided to do a double whammy and do I guess the “Big” part in this title is misleading. This was possibly the easiest DIY ever DIYed. 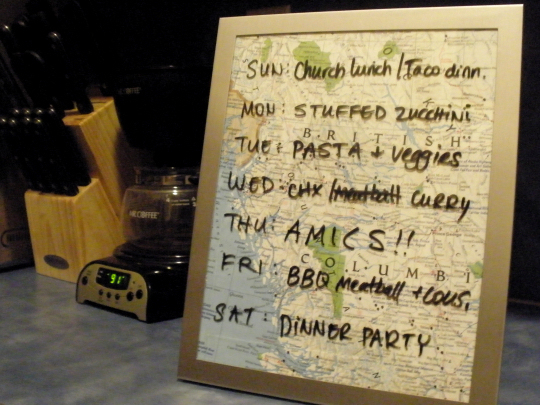 It involved buying a new, pretty shiny, faux stainless steel picture frame from Target (approx $7) and some dry erase markers. I have a stash of maps–you may have seen some of them in the office in my recent home tour. Well, I love maps with lots of water and decided British Columbia would fit the bill nicely. I cut a piece to size, inserted it, and planned a week’s worth of meals. Our kitchen walls are plaster so I’m not going to attempt to hang this up (nails are a disaster in here) so for now it takes up valuable real estate on our tiny counter. I was considering using magnets to put it on the refrigerator but it’s surprisingly heavy. I will come up with a solution someday. Did you participate? You inspired by me to make a dry-erase note board? Please comment! I love comments! Meal planning is the only way to prevent coming home with bags of frozen chicken nuggets from the grocery store.